This entry was posted on July 31, 2018 by Chris Elliott. Grey wood flooring is becoming more and more popular. Over the last few years you have been able to find more and more grey wooden floors. Grey wood flooring tends to match most decors and styles of home. This is why it is a becoming sought after product. The beauty is that you have a natural and beautiful floor, with a stylish and chic colour. As a result of grey wood flooring starting to dominate the market, there are lots of different shades and tones of grey for you to choose from. Traditionally you could only get a medium or stone-grey flooring, but now your choices are much more varied. Popular types of grey wood flooring now include pale or subtle grey tones, and very dark grey flooring. 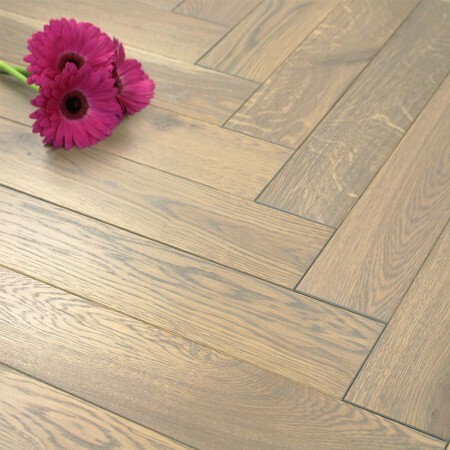 You can also find grey parquet block and chevron flooring. Due to the vast variety of greys to choose from, we would always advise that you order samples first. This allows you to see the real shade of grey in your own home. How is Grey Wood Flooring Made? Wood is not naturally grey in colour, so the grey effect is added to a pale species of wood (usually Oak), during the manufacturing stage. First of all, the planks or blocks of flooring are made, the fitting profile is added and then the grey stain is applied to the surface of the floor. Finally, the flooring is finished with an oil or lacquer. Alternatively, you could buy an unfinished Oak floor and then add a grey colour stain yourself. This would allow you to have greater control over the exact shade of grey you wanted to achieve. 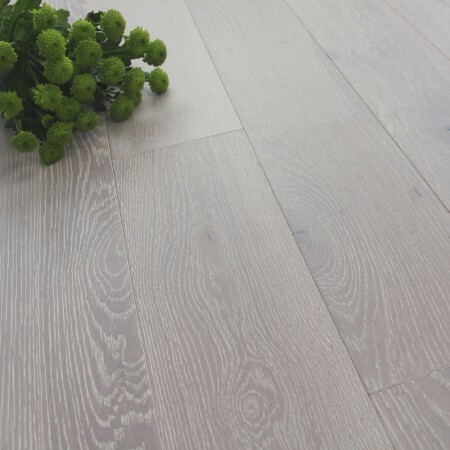 A subtle grey floor can still look very natural with the grain patterns and knots from the Oak showing. The floor would have a pale grey stain added to offer you a hint of colour which can help to highlight and accentuate to grain. A pale or subtle hint of grey can be a great choice if you want to create a light or airy space. The pale tones can really brighten up any size or shape of room. A dark grey wood floor has a much more dramatic effect. The grain and knots of the wood are still visible, but the dark grey stain takes over, changing the colour of the floor completely. 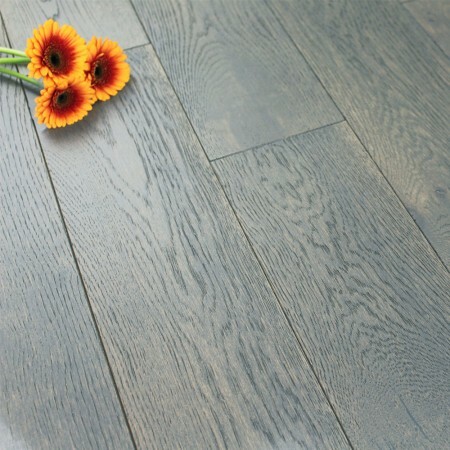 A dark grey wooden floor is ideal if you are looking for a statement piece. It is the perfect match for a pale coloured interior and can add warmth and charisma to your room.